Our evaluations, our research and increasingly our monitoring, provide us with evidence of outcomes, or the positive changes that children experience in their psychosocial well-being, protection, education and participation in decision-making that affects their lives, achieved through our projects. Some projects work towards one strategic objective, however, over the past few years they have increasingly contributed to multiple strategic objectives through the integration of psychosocial support, protection, and education programming into individual projects. This is a very positive development and totally in line with the ambition formulated in the recalibrated strategy. We believe integrated projects are more effective because outcomes in education, child protection, child participation and especially psychosocial well-being are interdependent and reinforce each other. The table below demonstrates how War Child has moved toward more integrated and comprehensive projects over the last three years. 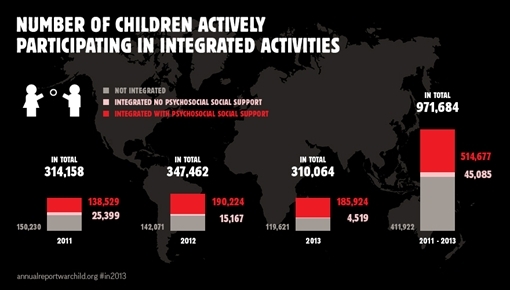 The table presents the number of children that actively participated in projects that work towards one of our strategic objectives (not integrated), in projects that integrate protection and education programming but don’t include psychosocial support, and in integrated projects that include psychosocial support. In 2013, there was a significant increase, from 44 to 60 percent, in the number of children reached by fully integrated projects, working toward psychosocial support (PSS), child protection (CP) and education (EDU) outcomes. In several other articles we present a few examples of outcomes achieved by projects integrated to varying degrees. These outcomes were identified and verified in external evaluations and research in 2013.